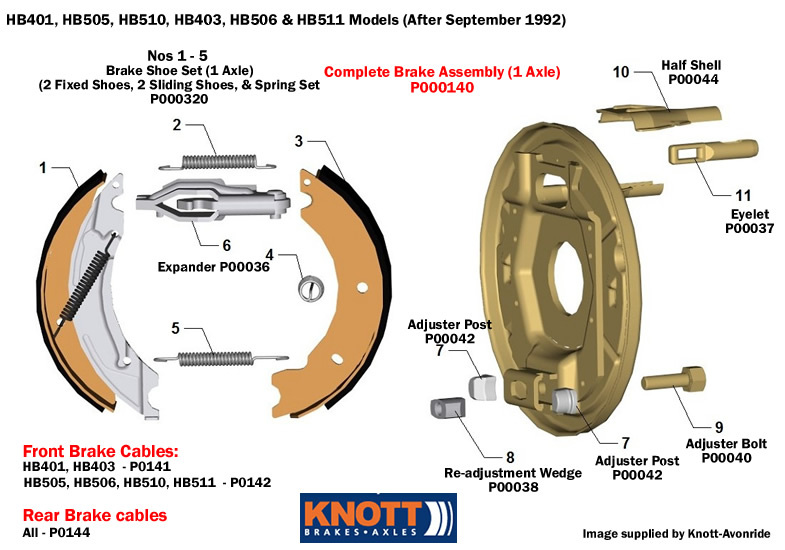 The products in this section are for Ifor Williams HB401, HB505, HB510, HB403, HB506 & HB511 horse trailers, the diagram below shows a break down and the part numbers required. Type 3 Brake Cable for Knott Brakes 22mm Tubular End Fitting, Inner 1110 Outer 900 Used on Ifor Williams trailers ma.. Type 3 Brake Cable for Knott Brakes 22mm Tubular End Fitting, Inner 1340 Outer 1130 Used on Ifor Williams trailers ma..
For trailers from Jan 96. Brake assembly 200 x 50 RH & LH - Bolt on type back plates pre-assembled w..
Ifor Williams Setscrew M12 - F0940S Fixes a 200 x 50 backplate to the axle stub (needs 4 per side) Catego..
Ifor Williams Steady Spring - P00051 For 200 x 50 brakes, holds the shoe against the backplate (fixed shoe only). Ca..
Ifor Williams Carrier Spring - P00048 Holds the sliding shoe onto the carrier (2 off per wheel). Category: Ifor William..
Ifor Williams Re-adjustmentn Wedge - P00038 Fitted immediately behind the adjuster bolt this acts on the adjuster posts ..
Ifor Williams Adjuster Post - P00042 For 200 x 50 brakes, fitted each side of the adjuster screw (2 required per brake)..
Ifor Williams Compensator Beam - C10800 Used on twin axle trailers (requires two rockers to complete). Category: If..
Ifor Williams Rocker - C10799 Two of these are fitted to the compensator beam on twin axle. Category: Ifor William..
Ifor Williams M10 Spherical Seat Nut - F1090Z M10 used at the compensator end of the brake rod. Category: Ifor Will..
Ifor Williams Eyelet - P00037 Connects the brake cable to the expander assembly. Category: Ifor Williams Knott 200 x 5..
Ifor Williams M8 Spherical Nut - F1091Z M8 used at the compensator end of the brake cables. Category: Ifo..
Ifor Williams Expander - P00036 Fits between the brake shoes (same expander for left or right). Category: Ifor Williams..
Ifor Williams Half Shell - P00044 Shell for cable entry to backplate Category: Ifor Williams Knott 200 x ..
Ifor Williams Inspection Plug - P00045 For 200 x 50 brakes, covers the hole that allows brake lining inspection. &..
Ifor Williams Adjuster Bolt - P00040 M10 40mm long hexagonal headed High Tensile bolt. Category: Ifor Williams Knott 2..